The bad news for the Yankees is that Mark Teixeira suffered a Grade 2 strain of the hamstring and will miss the rest of the season. The good news for the Yankees is that likely means he’s only going to miss one game. 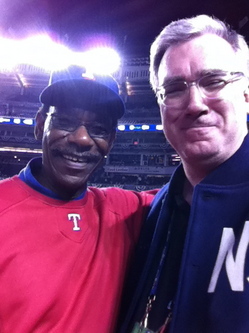 Ron Washington, concurring that to beat this crumbling but still dangerous New York team requires treating them like vampires, did exactly that the last two nights, managing as intensely in the 9th Inning as he did in the 1st. The results are obvious and the Yanks’ best news is probably that ex-Golden Gloves boxer “Grim LeRogue” didn’t get close enough Monday night to try to beat up Alex Rodriguez in some kind of expression of obsession with actress Cameron Diaz. The Rangers did it for him, and not just to A-Rod. As it proves, should’ve been a sweep. The questions are obvious: why wasn’t Joe Girardi satisfied with five two-run innings from A.J. Burnett? How is Sergio Mitre at the playoffs without a ticket? Just leave the pile of queries in a box for the next manager. One non-ALCS note: Barry Bonds at the Giants game. Just me or did it look like he lost weight? From his head! More than a little fuzzy (sorry). But the gentleman leaning on the seat ahead of him, hands together, upper left, is Nolan Ryan. In the lower right, Mayor Mike Bloomberg. This was taken Monday Night, but each deserves a shout-out. 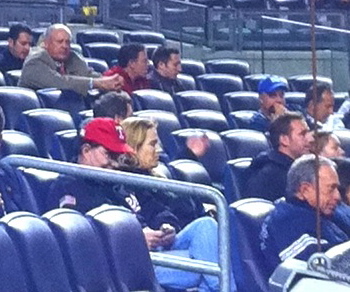 Bloomberg stayed until nearly the final out of each Yankee debacle and despite the vast numbers of empty seats, Ryan politely stayed in his 6th row locale. Delighted to find Mgr. Washington is a viewer of the tv show. 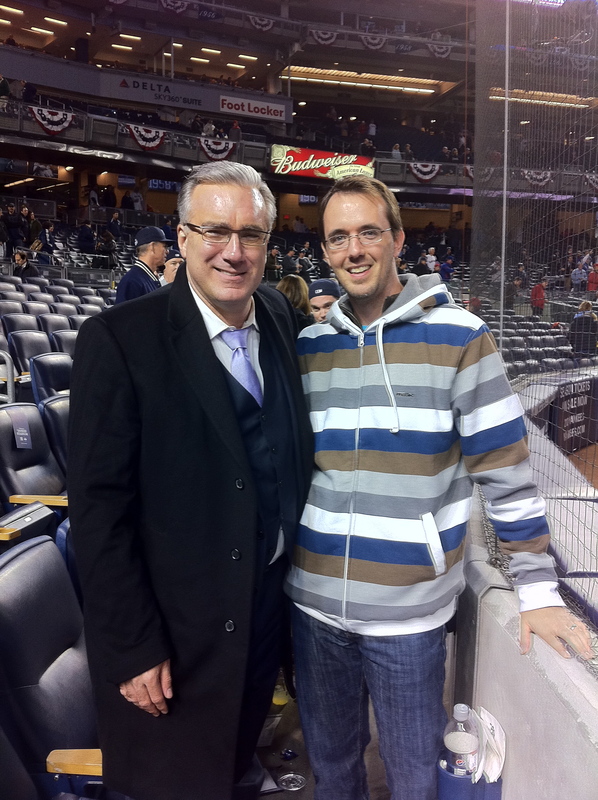 We had two nice chats pre-game and he did a heckuva job. 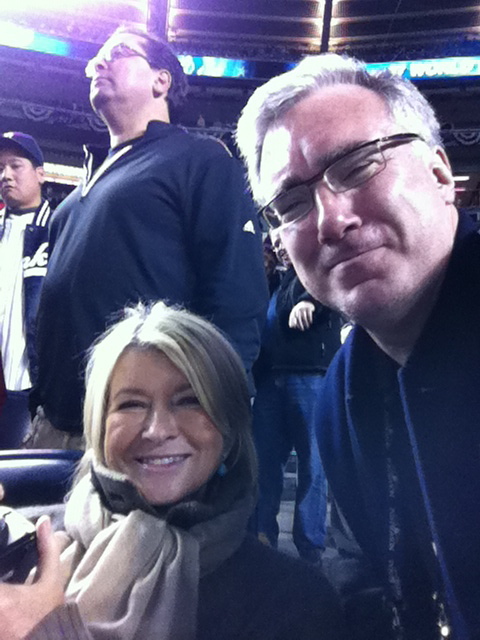 On the right of course, Martha Stewart, who, so long ago, on Opening Day, took a picture of me and tweeted it to her followers, so tonight I took this picture and tweeted it to both her followers and my own. Big celeb night, half the cast of Saturday Night Live in the front row (Andy Samberg, Jason Sudeikis, Fred Armisen, Kenan Thompson, Jay Pharoah, producer Lorne Michaels and that could’ve easily been this week’s host Emma Stone). Across the aisle from Martha: Mark Cuban. Upstairs, Michael Jordan and Jay-Z. And any of them could’ve pitched better than Sergio Mitre.